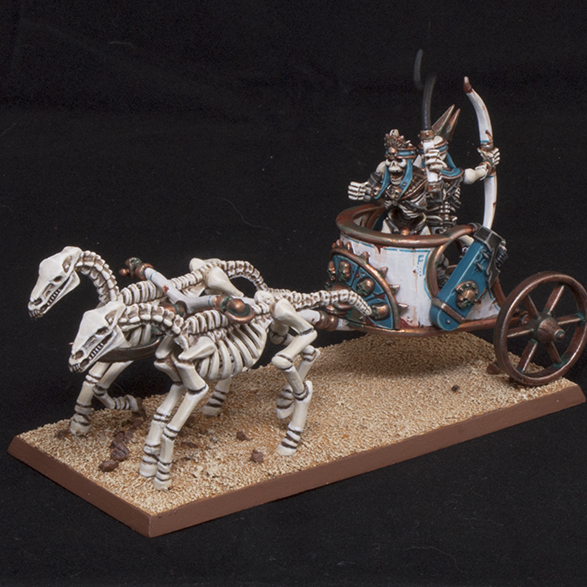 It's always interesting to paint a new model for an old unit. 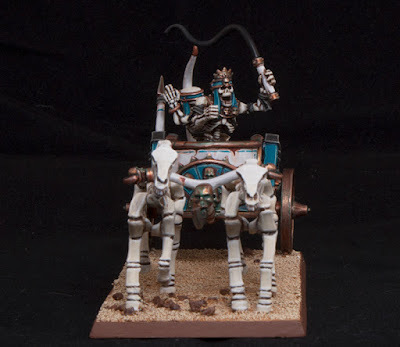 I had painted my original three chariots several years ago, but lately have been using four in my games so I decided it was time to start painting more. Just like my Tomb King on Chariot I primed the different parts of the model with different colors. 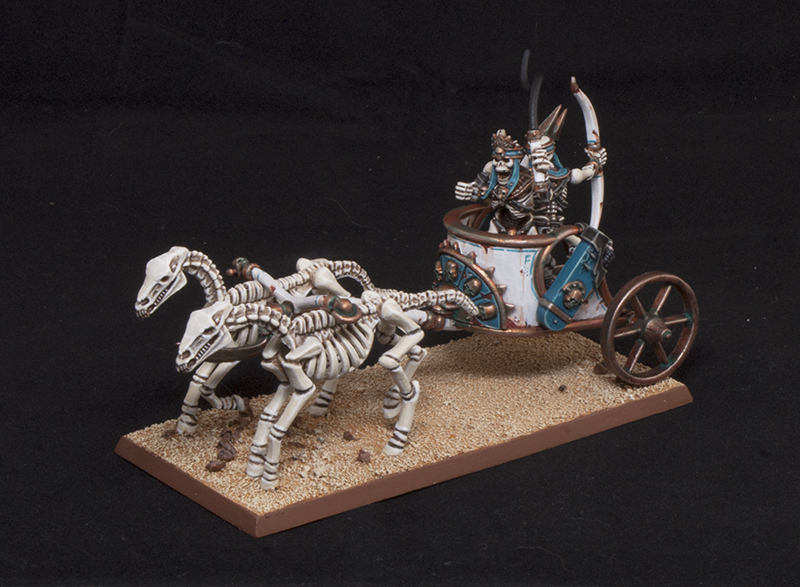 The base with the horse and the crew were primed with a bone color while the chariot itself got sprayed with grey. The bone was given a quick wash of Agrax Earthshade, being careful to put it only in the crevices so I wouldn't have to clean up all the large flat surfaces too much later. It then got a drybrush of a Screaming Skull/White mix before being further cleaned up with the same mix. The last step was a line highlight of pure White on the edges. The most difficult part was trying to match everything to the existing chariots. 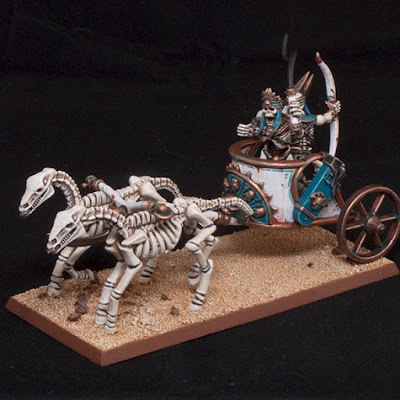 All of my previous chariots were painted with the old color line, and while I still have a few pots of some of the older paints left, most of them have run out by now. The gold is the most obvious difference. 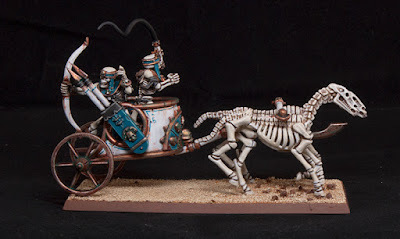 I had used Shining Gold on all of the older ones, but the newer version that GW says is a color match, Gehenna's Gold, has a much stronger orange tint. There's not much I can do about that though, so besides that, most everything else matches. 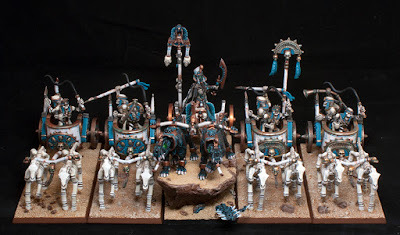 One thing I have noticed comparing this new model to the existing ones is that over the years I have gotten much more controlled with my highlights. All of my line highlights and freehand are a lot thinner now. This is most likely due to just gaining more experience. I have also switched what brushes I use though. 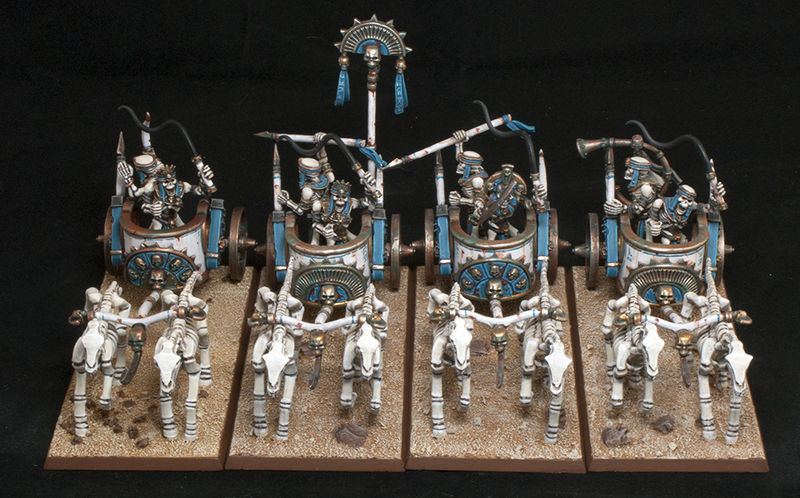 Back then I used GW or Army Painter brushes for almost everything. Now I only use those for basecoats or washes and primarily use Scharff brushes for all the detail work. When you see the unit all together you can notice the differences in color, but for the most part it blends in pretty well. 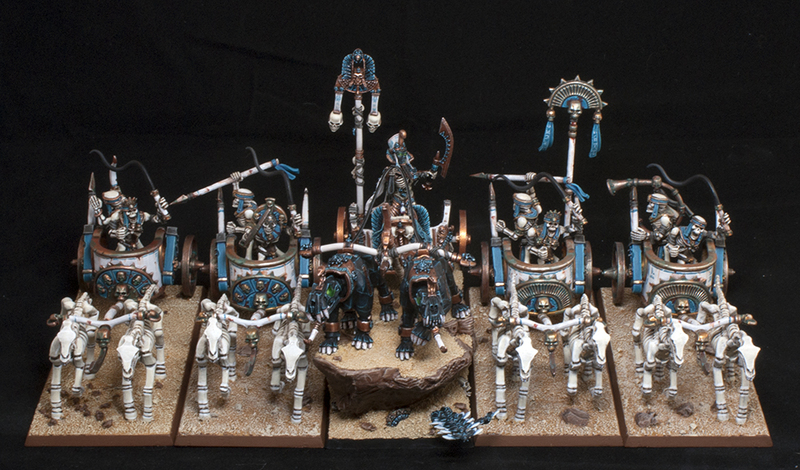 I apparently also paint the bases slightly different since my newer ones look to have more saturation. 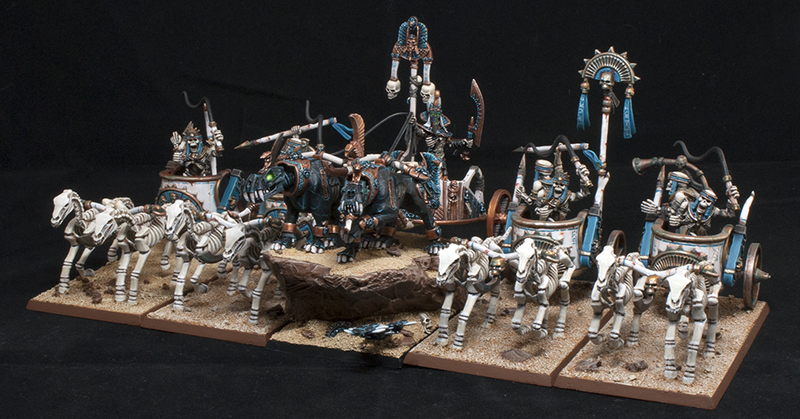 I have to say the unit looks pretty impressive all together, especially with the King leading it. I bought a bunch of chariots off eBay recently so I hope to have a unit of at least six eventually. I will probably also make a second smaller unit as well as a Herald on a chariot. 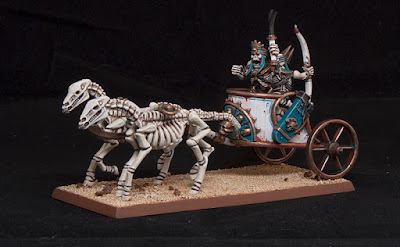 I have a short video to go along with it just showing off a 360 degree shot of the new chariot and the unit as a whole. The music is once again provided by Adam Harvey, you can follow him on his Facebook page and listen to some more of his music on his Youtube channel. Enjoy!